Fayetteville, AR (September 7, 2018) - Research into how plants combat aphid attack using a reactive form of oxygen has earned Arkansas entomology Ph.D. student Hillary Fischer honors from the Entomological Society of America. ESA presents the Lillian and Alex Feir Graduate Student Travel Award in Insect Physiology, Biochemistry, or Molecular Biologyto graduate students working in those disciplines. The group announced the award Aug. 21. Fischer’s research aims to understand the role of singlet oxygen in plants for defense against aphids. Singlet oxygen is produced during photosynthesis and can serve as a signaling molecule for plant defense. Because singlet oxygen has a short half-life, it is very difficult to study. Fischer plans to improve techniques used to study it and showcase its role in signaling for aphid resistance. Fischer is a member of the Plant-Insect Ecosystems section of ESA, but she was able to win this award from the Physiology, Biochemistry, and Toxicology section of the organization because of her use of molecular techniques. The award recognizes her use of new technology to understand the physiology and biochemistry in plants. “I’ve always only been in plant-insect ecosystems even though my research could fit in other categories, and I like the idea of branching out and being affiliated with different groups,” Fischer said. It was Fischer’s adviser, entomology professor Fiona Goggin, who encouraged Fischer to apply for the award, and she couldn’t be happier with her student’s success. Fischer said she has always looked up to her fellow entomologists and winning an award in the field has been an irreplaceable experience. 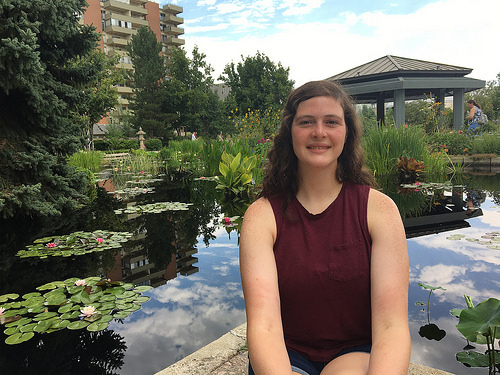 Fischer recently brought home the President’s Prize at the National Entomological Society of America meeting and the Robert T. Gast Award at the Southeastern Branch ESA meeting, both for outstanding presentations of her research. Before beginning her Ph.D. studies at the Dale Bumpers College of Agricultural, Food and Life Sciences in Fayetteville, Fischer earned bachelor’s degrees in entomology and plant biology from the University of Nebraska-Lincoln.